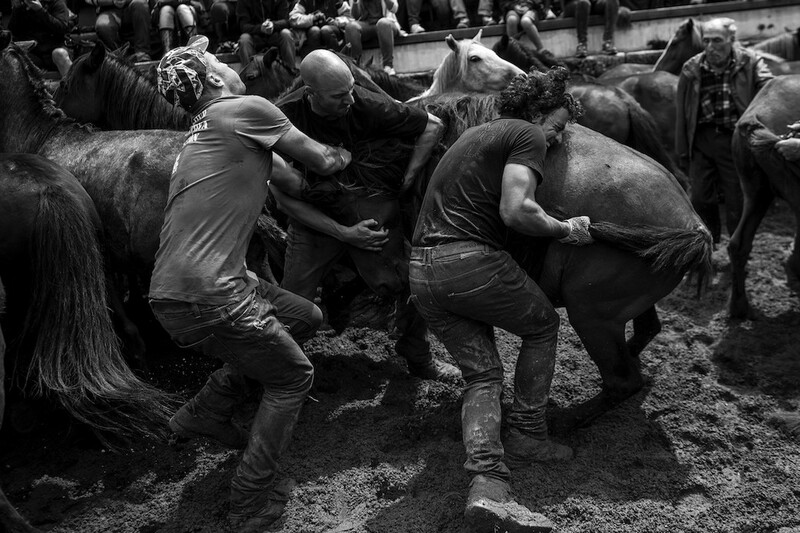 Few tangles between man and beast are as raw and primitive as the horse-wrestling portion of the annual “Rapa das Bestas,” in northwestern Spain. 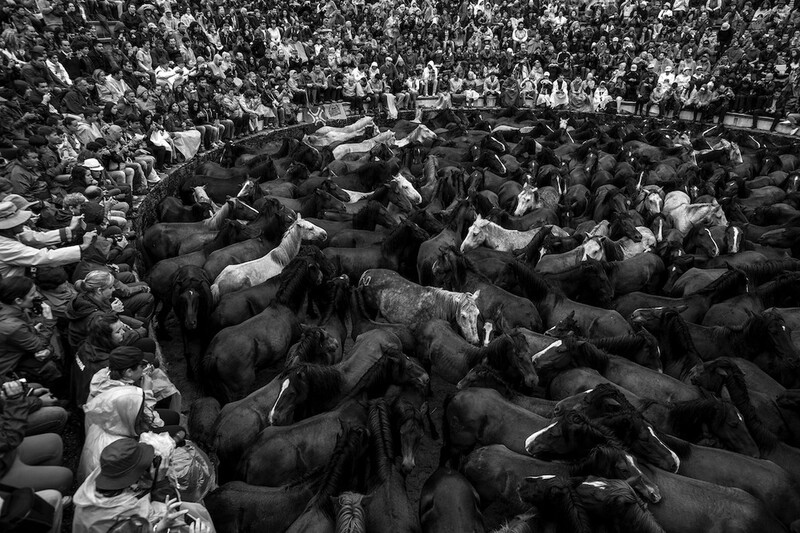 Alternately translated as the ‘shearing’ and the ‘reaping‘ of the animals in question, this time-honored event has villagers bringing free-range horses into town for a forced clipping of their manes and tails. But it is the aggressive pre-grooming process that stands out, for better or worse, as unique. Animal-rights activists routinely protest its excessive force. 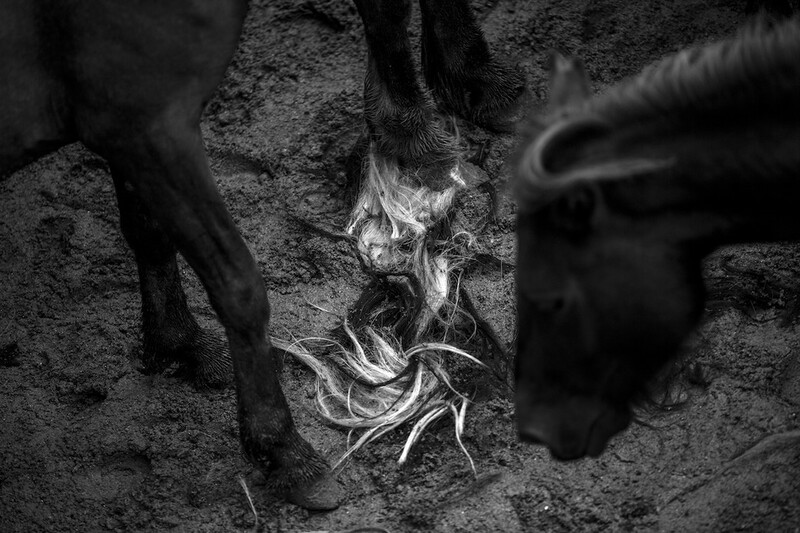 Like the bloodier sport of bullfighting, the ritual subjugation of these feral horses registers to many as an offensively vivid example of man’s dominion over animals. In the 21st century, that dominion is a reality nearly everywhere on earth. The developed world has spent recent decades softening it or concealing it. Spain, though, is one of the few Western countries where human mastery is still performed with all the sweat, fear, and bulging veins of original conflict. What opponents decry as equine anxiety, proponents embrace as adrenaline. While they’re at it, residents of Sabucedo like to mention that the humans who inevitably win the wrestling contests are also more likely to be hurt in them. Man is a funny beast. It is not an argument that will be resolved soon. 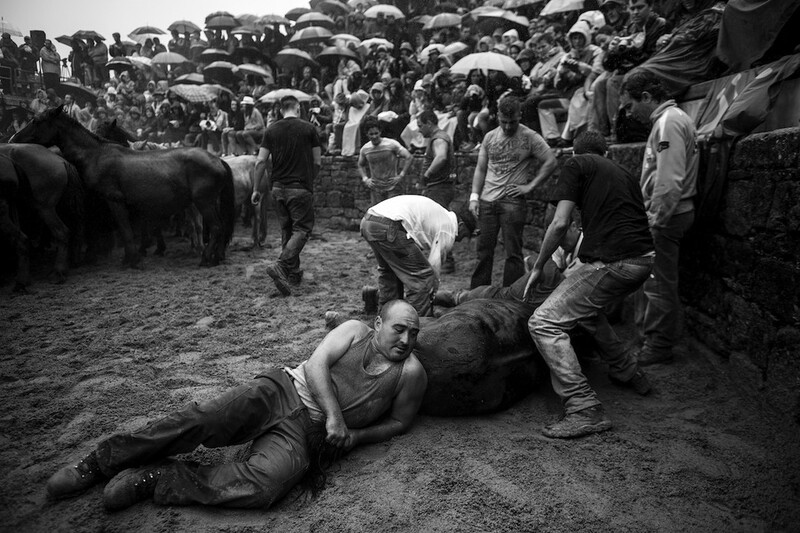 Other Galician towns celebrate the Rapa das Bestas. 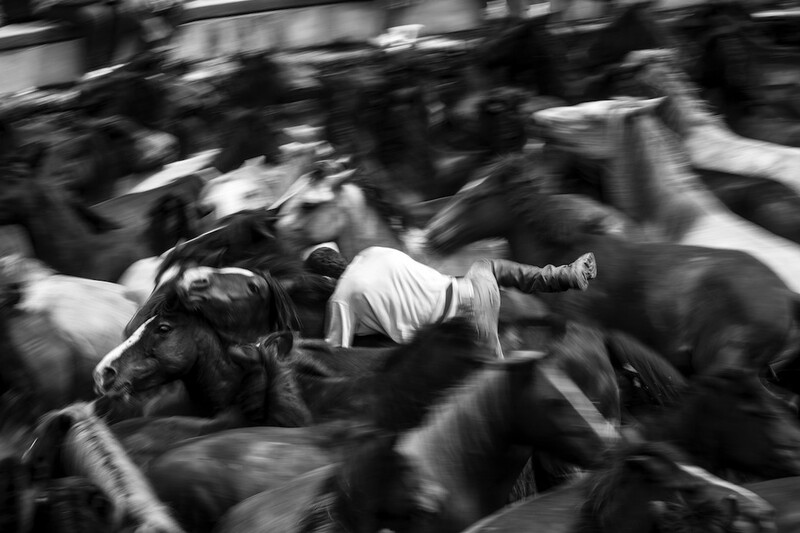 But Sabucedo is the only one in which grapplers challenge the horses without benefit of ropes. The horse-wrestlers, or aloitadores, embark with several ends in mind. Proving one’s virility is certainly among them. Another is to take an accounting of the herds. The presumed hygiene of trimmed manes and tails is yet another, although there’s a debate there, too. 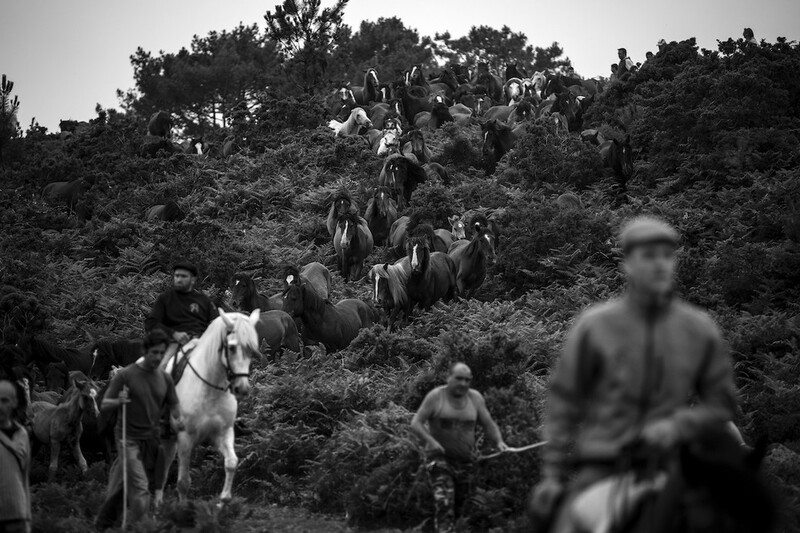 The day begins with villagers heading into the mountains, making their way through gorse and bracken, on horseback and on foot. They are prepared for cold rain, which might strike in the midst of summer. Rounding up these feral herds—which range freely but which do, with the exception of the stallions, have owners—is no easy task. But driving them down to town is just the beginning. 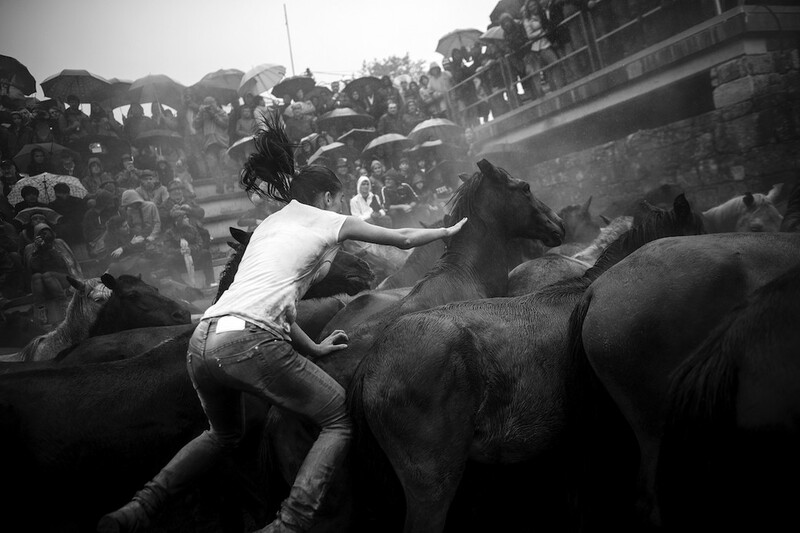 In the center of Sabucedo, some 200 horses are corraled into a circular pen called the Curro. Some boys watch, while others enter the ring for the comparatively easy task of removing foals. 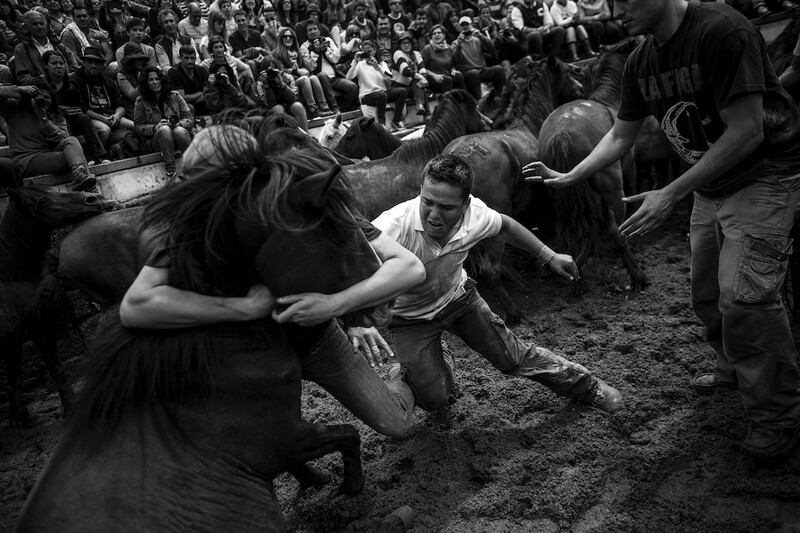 Then the skilled wrestlers come in, hearts pounding—and communicating, for bringing down a resistant, full-grown horse to requires intense coordination. 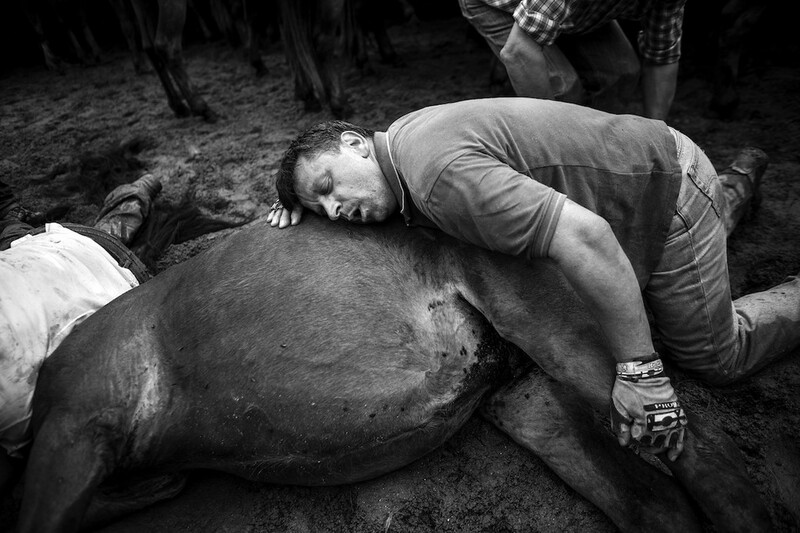 One man wraps his arms around the head, partially blindfolding the animal with his body. A second latches onto the head, while a third grabs the tail. Once the horse has been pulled free into space, all three combatants heave it onto the ground. The shearer approaches to snip the mane and tail. In a gesture of distinction and respect, he also notches the ears of the strongest horses. 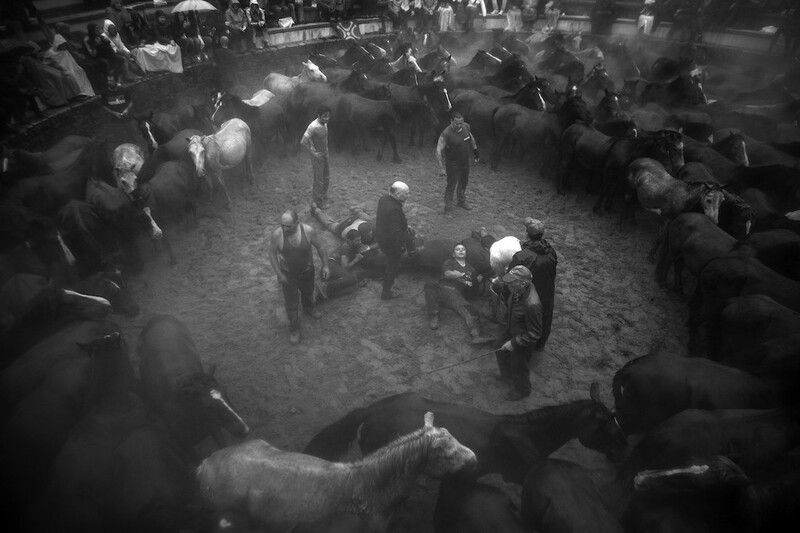 The Rapa das Bestas, of which the Curro chaos is one small part, takes place the first weekend of July and lasts four days. Common lore dates it to the 16th century, when two local sisters prayed to a saint that they would release a prize mare and a stallion if he protected their village from the plague. Sickness did indeed spare Sabucedo, and grateful residents let the horses run free. But this origin story may simply be Christian spin on a much older tradition. Galicia’s abundant petroglyphs suggest that the Celts, the region’s pre-Roman inhabitants, have been taming wild horses here since the Iron Age. Sabucedo residents have recently added vaccinations to the process, perhaps as an inoculation against protest. (Another update: women occasionally get in the ring now.) But there’s also an interesting reversal there, one that puts the horses in the role of those medieval villagers, and the villagers in the role of patron saints—albeit with an extremely rough touch.